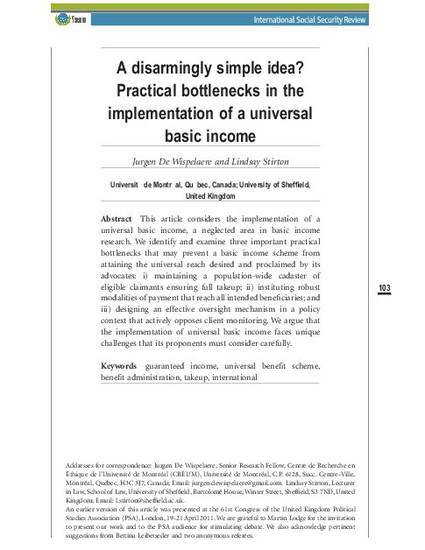 This article considers the implementation of a universal basic income, a neglected area in basic income research. We identify and examine three important practical bottlenecks that may prevent a basic income scheme from attaining the universal reach desired and proclaimed by its advocates: i) maintaining a population-wide cadaster of eligible claimants ensuring full takeup; ii) instituting robust modalities of payment that reach all intended beneficiaries; and iii) designing an effective oversight mechanism in a policy context that actively opposes client monitoring. We argue that the implementation of universal basic income faces unique challenges that its proponents must consider carefully.